Today, many builders are routinely building houses that are very airtight, often without realizing it. The common use of building wraps, moisture barriers, high efficiency windows and even simple plywood sheathing all have direct effects on reducing air leakage and infiltration. An airtight house has many fewer openings through which fresh air can enter. Without the addition of mechanical ventilation, a tight house can result in stagnant air, less natural ventilation and dissatisfied homeowners. On the other hand, houses with large amounts uncontrolled air leakage are equally troublesome with comfort complaints due to drafts, building failures and high energy bills. Despite the growing importance of house airtightness, few builders, architects or homeowners know how tight their houses are. Until recently, the building community has tended to rely on subjective estimates of airtightness. Unfortunately, it is impossible to accurately estimate the tightness level of a building by visual inspection alone. And without knowing the airtightness level, it is difficult or impossible to design for effective approaches to ventilation and air quality, or to accurately diagnose performance problems. Why is Building Leakage Important? Building tight houses without providing proper ventilation can increase the potential for health and safety problems to occurs. Higher moisture levels found in inadequately ventilated houses create an ideal environment for molds, dust mites and other causes of respiratory problems and allergies. Tighter houses are also more likely to experience problems from backdrafting and spillage of combustion products from naturally drafting furnaces, water heaters and fireplaces. This is because in tight houses, it is easier for exhaust devices (e.g. dryers, kitchen and bath fans) to create large pressure differences between inside and outside of the house, which can interfere with proper venting of the combustion appliances. Leaky houses have their own set of problems ranging from drafts, blistering paint, ice dams and frozen pipes to a house that won't adequately heat or cool. While in the past airsealing efforts concentrated on the easy to find air leaks around windows and door, we now know that the most important leaks in a house are the hard to find leaks in the attic, crawlspace, attached garage and other framing connections. These hidden leaks are responsible for most of the air leakage in typical houses, and are often the cause of performance and durability problems. And whether a house is tight or loose, nothing will cause it to deteriorate faster than moisture migration and condensation in attics, ceiling and other building cavities. Vapor barriers will stop moisture diffusion, but most moisture problems in buildings are a result of uncontrolled air leakage through the building envelope. And the way most vapor barriers are installed, they do little or nothing to stop uncontrolled air leakage. In many buildings, moisture problems are made worse by the common use of hot tubs, whirlpools and saunas. By simultaneously measuring the air flow through the fan and its effect on the air pressure in the building, the Blower Door system measures the airtightness of the entire building envelope. The tighter the building (e.g. fewer holes), the less air you need from the Blower Door fan to create a change in building pressure. In addition to assessing the overall airtightness level of the building envelope, the Blower Door can be used to estimate the amount of leakage between the conditioned space of the building and attached structural components such as garages, attics and crawlspaces. And because the Blower Door forces air through all holes and penetrations, these problem spots are easier to find using an infrared camera. Finally, Blower Door measurements can be used to estimate the natural infiltration rate of houses. 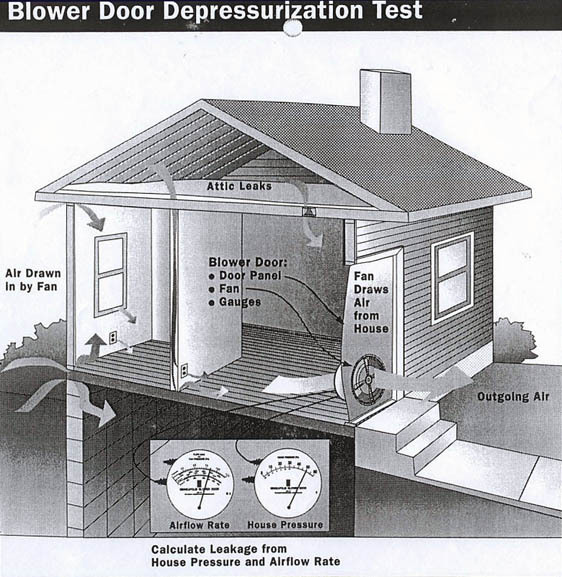 While the Blower Door doesn't measure infiltration rates directly, test results can be used along with mathematical models to estimate annual average and design infiltration rates for the purposes of evaluating indoor air quality, the need for mechanical ventilation, and to help with proper sizing of heating and cooling equipment.